Professor of Economics and Public Policy at King's College London, and Senior Fellow, UK in a Changing Europe. Economics, immigration, welfare, and public policy..
Chris Giles' FT piece here argues essentially that the political debate focuses too much on fiscal policy; and that given the uncertainty about the impacts past and future, of fiscal policy, economists should refrain from taking sides in this debate. I think that while there is much in Chris' piece that I agree with, ultimately his conclusions are confused at best, and damaging at worst. I shall make extensive reference to his points below, but I don't want to misrepresent him, so please do read his piece first! GDP figures today were revised down to -0.3%. As I've said before, small quarterly movements of this sort are largely irrelevant to the broader picture. What was initially a reasonably strong, albeit patchy, recovery stalled in the autumn of 2010; since then there has been essentially no growth at all. The government can and should act now. Amid the gloom, recent statistics have contained one piece of relatively good news; exports are doing well, especially to countries outside the EU. In particular, we continue to run a large surplus on trade in services. What sort of services do we export: financial services and insurance, business services, the creative industries - and education. The Department for Business estimate that in 2008-09 the value of education and training exports was about £15 billion. This looks to be about the same at the time as our exports of food and drink, and maybe half of our exports of cars, which are now rising sharply. I've written on this before in depth, most recently here, but I thought the juxtaposition of what the Prime Minister said today, and the Bank of England's analysis in its Quarterly Inflation Report, also today, was worth noting. [Update. David has responded here. His post simply ignores the second-to-last para below. which addresses the substantive point. At this point, I really don't know whether it is because he's dug himself into a hole and doesn't want to admit it, or because he genuinely doesn't understand the government's intertemporal budget constraint - a standard identity, taught in any decent graduate macro or public finance course, if not before.]. "if the government were, as I suggest, to fund a £30 billion (2% of GDP) investment programme, and fund it by borrowing through issuing long-term index-linked gilts, the cost to taxpayers - the interest on those gilts - would be something like £150 million a year." "No, again, £150 million of revenue doesn't give £30 billion of funding. £1 billion - real yield plus inflation - might." Why is David wrong? Well, as the chart in the post showed, real interest rates for very long term index linked gilts have been hovering around the 0.5% mark for the last couple of years. Indeed, they are currently lower, and recently the government has actually auctioned index-linked gilts at real rates of basically zero, but lets take 0.5% as the government's current real borrowing rate. David hasn't argued with that. "with long-term government borrowing as cheap as in living memory, with unemployed workers and plenty of spare capacity and with the UK suffering from both creaking infrastructure and a chronic lack of housing supply, now is the time for government to borrow and invest. This is not just basic macroeconomics, it is common sense. " [This article originally appeared in the Independent here]. Two years ago, the coalition set out its programme for government. Today, the Prime Minister and Deputy Prime Minister reaffirm their commitment to the central element of that programme - cutting the deficit quickly. This is despite the dismal results this strategy has delivered, despite the fact that even the IMF is arguing that there are more sensible alternatives, and despite the growing realisation in the eurozone that austerity is a dead end. But, particularly in the light of the Governor of the Bank of England's comment that the government's approach was a "textbook response to the situation", it is worth looking back and considering what the new government's options were and whether there was, in fact, no alternative. After the election, it was clear that the recession had left a massive hole in the government's finances. Ultimately the books needed to be balanced; spending would have to be cut, and taxes increased. The question was timing: cut the deficit quickly, or wait until growth was reasonably strong again. Both David Cameron and I, from our very different perspectives within government, understood this. But ultimately the decision was the Chancellor's. "In doing so, I have had to balance two key objectives : first, the essential task of helping recovery; secondly, the need to tackle the deficit so that the recovery will be sustained. I believe that my proposals today strike that right balance. In the year ahead their effect will be broadly neutral, thus allowing the recovery to take hold. However, for subsequent years, as the economy strengthens, my proposals are designed to build in a wedge of steadily rising revenue." OK, by now you will have twigged I wasn't talking about 2010. The quote is from Norman Lamont's Budget Speech in 1993. David Cameron and I were both 26; I had been Lamont's speechwriter (a civil service position) through and after the election, although I'd left his office by the time of the budget. Cameron was still his Special Advisor. The 1993 Budget famously raised taxes (both National Insurance and VAT) to accompany previously announced tight restrictions on public spending. But neither kicked in immediately. 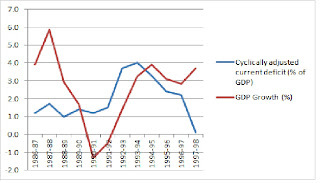 The deficit actually rose in 1993-94, and, according to the Treasury, so did the cyclically adjusted current deficit (the structural deficit that the government currently targets. So there wasn't any fiscal tightening at all. Only in 1994-95 did the deficits, both structural and headline, begin to come down. By the time spending cuts and tax increases actually began to kick in, the recovery was firmly established; growth in 1994-95 was close to 4 percent. 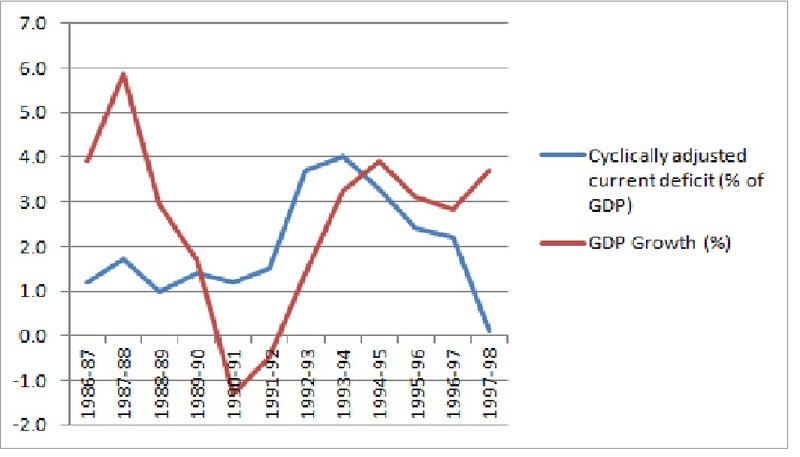 As the chart clearly shows, fiscal consolidation followed recovery; it did not cause it. "Some have suggested that there is a choice between dealing with our debts and going for growth. That is a false choice. The crisis in the Eurozone shows that unless we deal with our debts there will be no growth. And these forecasts demonstrate that a credible plan to cut our budget deficit goes hand in hand with a steady and sustained economic recovery, with low inflation and falling unemployment." So he announced what he described as an "accelerated reduction in the structural deficit." - aiming to reduce it by more than 2 percent of GDP between 2009-10 and 2011-12. Of course the forecasts turned out not to "demonstrate the credibility" of Mr Osborne's plan, but rather the reverse - unlike Mr Lamont's, which turned out to be very much on the cautious side. Two very different approaches. Two very different results. But hardly surprising, to anyone who remembered even the basics of undergraduate macroeconomics. There is a simple, absolutely standard prescription for dealing with an unsustainable deficit resulting from a recession. It is the following. Announce, and commit clearly to, tax and spending measures to deal with the deficit. But ensure implementation follows recovery, not precedes it. This is the "textbook response" that Mervyn King should have commended to the Chancellor. If done right, such an approach will ensure fiscal credibility, maintain confidence, and allow businesses and households to plan, without committing the elementary error of reducing demand when the economy needs it most. The 1992-97 Conservative government followed this prescription to the letter - and it worked. Pity about this one. NIESR's quarterly forecasts for the UK and world economies were published today, May 4.
cent below its pre-crisis peak. Growth this year will be close to zero, but about 2 per cent in 2013. We expect the unemployment rate to rise to almost 9 per cent at the end of this year, and to remain elevated throughout the forecast period. This will do permanent damage to the UK’s productive capacity.